I’m a writer and holistic counselling coach. I teach, guide and support you on your journey to wild freedom as you tune into the wisdom within and cultivate the courage to follow your heart’s guidance. …and to reveal your heart and true self in a world that can seem so insensitive especially to a sensitive soul. You hear the call or long to hear the call yet hold back because of fear, doubt, anxiety, confusion and self-criticism. You turn away and avoid for as long as you can until you realise that you can’t avoid it any longer. What is calling to you will keep calling to you and the fear, doubt, anxiety and confusion won’t dissolve until you step towards your longing. This journey requires un-learning, re-wilding, and reclaiming your own instinctual nature, inner compass, inner maps and inner heroine. It requires you to embrace your fears, anxieties, self-doubt, confusion, resistance and self-criticism, and to redefine what safety, success and a meaningful life means to you in place of what may have been handed down to you. We take this journey for the fulfilment of our souls, and because the world needs us more than ever to come home to our true selves so that we can live in harmony with the earth and each other. My personal journey has taken me from living the life that I thought would make me happy to awakening to the voice of my soul through my heart and following it’s guidance…albeit reluctantly at times, such is my dance with my soul. I spent my 20’s and early 30’s building my idea of the perfect life so that I could feel safe. I had a successful career working as an executive manager at an ASX-listed financial services company, a long-term partner I lived with in a trendy suburb, money in the bank, holidays, and a great lifestyle but I was desperately unhappy. I became increasingly depressed and cried every day on the way to work and on the way home. I was in deep despair wondering if this was all there was to life and if this is how I would feel for the rest of my life? It was a painful but beautiful invitation to awaken. My world momentarily stopped while I searched for an answer that I couldn’t find, then panic set in for a while. This question turned out to be a gift that helped me to return home to myself and discover what I truly wanted in my life. After my secondment finished, I returned to Melbourne and soon ended my relationship with my partner of five years moving out to start a new life on my own. I finally acted on my inner yearning to visit India and scuba dive the Similan Islands. I went alone and rediscovered pure joy and freedom. My inner voice started urging me to travel and be free for a while. I had spent months clinging to the hope that my manager would come true on his promise and find me another role. But he didn’t. A week after I came back from my holiday, I quit my job for the uncertainty of contracting. Nine months later I packed up my life and said yes to that ‘crazy’ urge to travel and went to South East Asia for a year to follow my love of scuba diving. That year changed the course of my life. I wandered all over South East Asia. I scuba dived with manta rays, turtles, reef sharks, mola mola and whale sharks. I trained as a PADI divemaster and open water scuba instructor. Watching sunsets became my religion. I fell in love with the earth. I rediscovered wonder in the beauty around me and the freedom of following my heart. For a few years I lived between Thailand and Melbourne. Then I discovered the ancient pilgrimage route, the Via Francigena, first walking a 120 kilomtre section through Tuscany, and two years later, after a sudden redundancy, I walked the whole route from Canterbuy in England to Rome in Italy. I walked the Via Francigena to honour the healing of childhood and ancestral trauma, and the complicated grief from my mum’s death. And I walked to answer the question of what I wanted to do with my life that will bring me alive every day using my unique gifts to make a difference in the world? On my Via Francigena pilgrimage, my life slowed down to a maximum of 4 kilometres per hour and I spent 85 days walking out into the unknown countryside, held and often challenged by nature, relying on my intuition and listening for the voice of my soul. I heard its whispers although I initially doubted and dismissed them for not being clear enough. Sometimes we want to see the top of the mountain when we’re still at the very bottom needing to take the first step towards the peak. But the whispers persisted and I answered their call. My calling in this lifetime is to support you on your journey to wild freedom as you listen to and follow your heart’s guidance and courageously cross the threshold from the known into the unknown world that is calling you with all the fear, trepidation, anxiety, confusion, excitement and ultimate joy that step holds. I write to remind you of the innate wisdom and unique essence that lives inside of you. I offer a safe and sacred space to support you as we listen deeply to the call within. I honour your sensitivity as a source of great wisdom and power. I shine a light on the dark places you can’t see, offering insight and perspective when appropriate, encouraging your belief in yourself and the highest possibility of your life. I help you find your own wise way to answer your questions and to transform fear, anxiety, self-doubt, confusion and self-criticism. 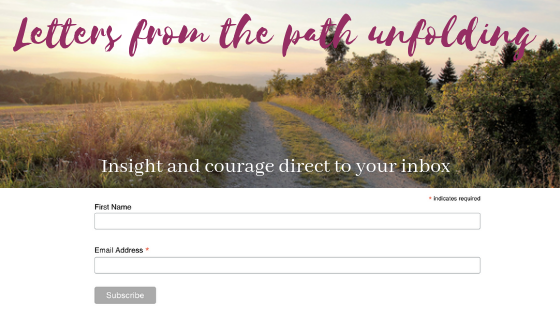 I offer this support through 1:1 sessions, and my writing via my blog, newsletter, and my forthcoming book about my heart’s healing and seeking journey on the Via Francigena, The Path We Make: a journey of the heart on the Via Francigena. I draw upon all areas of my life, including my leadership and management experience from over 15 years in the Financial Planning industry where I managed and coached back office teams and supported the integration of business acquisitions, my own awakening and healing experience, along with my natural gifts of intuition, insight and empathy. I have completed a Bachelor of Commerce and a Diploma in Holistic Counselling and I’m a member of the International Institute of Complementary Therapists (IICT). As a gifted problem solver, I use my intuition and perception to get to the root of an issue and identify practical and implementable solutions. It is this gift that helped me to excel into executive management positions in the corporate world. After spending so much time in nature, scuba diving and my pilgrimage, I know the true value of slowing down, silence, asking for guidance and listening. Feeling held and supported by nature or a trusted other is healing and nurturing. When we truly feel safe, anything is possible. Our time together is an opportunity for you to experience this too. I have been interested in spiritual and personal development since my late teens. Over the years, I have studied meditation, reiki, theta healing, pellowah, buddhism, women’s wisdom and feminine embodiment practices, pilgrimage and holistic counselling. Whilst our life’s journeys may look very different, my sincere wish is that whether we cross paths through my website, writing or 1:1, that I touch your heart in some way, and leave you feeling encouraged and inspired to live boldly. This would be my deepest honour.